Alex Rodriguez got hit, and Roger Clemens made sure it didn't go unanswered. Rodriguez was hit on his calf by a pitch from Josh Towers during New York's 9-2 victory in Toronto last night, and Clemens plunked Alex Rios in the middle of his back. Benches and bullpens emptied twice after Rodriguez was hit in the third inning. Clemens and Yankees manager Joe Torre were ejected by plate umpire Angel Hernandez after Rios was hit by the first pitch of the seventh. On a night that top prospect Joba Chamberlain made his major league debut and Jason Giambi returned after more than two months on the disabled list, the Yankees won their fifth straight and improved to 20-7 since the All-Star break. Several Blue Jays were angry at Rodriguez after he distracted Howie Clark on a key popup late in a game May 30, yelling at the infielder as Rodriguez approached third base. Jesse Litsch threw behind Rodriguez's legs in his first at-bat Monday and Towers hit the Yankees slugger on the calf during his second at-bat last night. Rodriguez immediately took a few steps toward the mound before he was cut off by Hernandez. The Yankees and Blue Jays spilled out onto the field. Toronto's Matt Stairs had to be restrained by New York's Andy Phillips as he tried to go after Rodriguez at first base. "It was heated," Torre said. "I'm just glad it didn't come to blows where it could have gotten ugly." After the field cleared and as the umpires huddled, Towers and Rodriguez exchanged words and walked toward each other. Rodriguez was restrained by first base coach Tony Pena as both benches and bullpens came onto the field again. No punches were thrown either time and no one was ejected from the game. Clemens (4-5) threw six shutout innings before he hit Rios with his first pitch of the seventh. Bobby Abreu went 2 for 5 with four RBIs for New York. Melky Cabrera had two doubles and a triple for his second straight three-hit game. Chamberlain, 21, made his major league debut in the eighth and pitched the final two innings. Giambi hit for Duncan in the ninth and grounded into a fielder's choice. Indians 2, White Sox 1 -- Jake Westbrook retired 23 of 24 batters at one stretch and Grady Sizemore hit a two-run single to help visiting Cleveland hold onto sole possession of the AL Central lead. Tigers 9, Devil Rays 6 -- Rookie Ryan Raburn had two RBIs and scored the go-ahead run in a three-run eighth to help host Detroit beat Tampa Bay. Padres 4, Cardinals 0 -- Jake Peavy extended his scoreless streak to 19 innings as visiting San Diego got its major league-leading 16th shutout of the season. Rangers 8, A's 6 -- Jarrod Saltalamacchia drove in the tiebreaking run with a sixth-inning double and Kason Gabbard went six innings to earn his first win for host Texas. Pirates 8, Diamondbacks 3 -- Arizona's Justin Upton, 19, fell a single shy of the cycle in his home debut but it wasn't enough to beat Pittsburgh's Tom Gorzelanny (10-6), who struck out a career-high nine in seven innings. Mariners 10, Orioles 3 -- Raul Ibanez had two homers and four RBIs as visiting Seattle won for the seventh time in 10 tries. 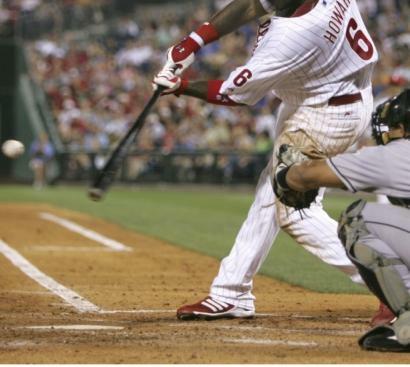 Phillies 11, Marlins 1 -- Ryan Howard homered twice to back Jamie Moyer as Philadelphia beat visiting Florida. Reds 4, Dodgers 0 -- Bronson Arroyo (5-12) pitched into the seventh inning, helping Cincinnati end its nine-game losing streak against Los Angeles. Astros 5, Cubs 2 -- Craig Biggio drove in the go-ahead run in a four-run sixth inning as Houston handed visiting Chicago its third straight loss. Braves 7, Mets 3 -- Matt Diaz hit a solo home run and Jeff Francoeur added a three-run shot as visiting Atlanta beat New York. Royals 4, Twins 1 -- Mark Teahen had four hits for his third straight multihit game as Kansas City defeated visiting Minnesota. Rockies 11, Brewers 4 -- Todd Helton hit two home runs and Colorado handed visiting Milwaukee its third straight loss.